The latest Xcode beta has some promising new tools for testing your iOS apps. From better error messaging to new results, your tests should be much smoother. This will set new DEVELOPER_DIR, and we are ready to use Xcode 8.3. Make sure you are using the correct toolchain using the xcrun --find swift command, which will show current toolchain you are using. Now, make sure you export the toolchain and are using the correct version of Swift, which is Apple Swift version 3.1-dev at the moment. You can easily do that by running the following commands. This will ensure that you are using Swift 3.1. Now we are good to try new the features of the XCTest framework. 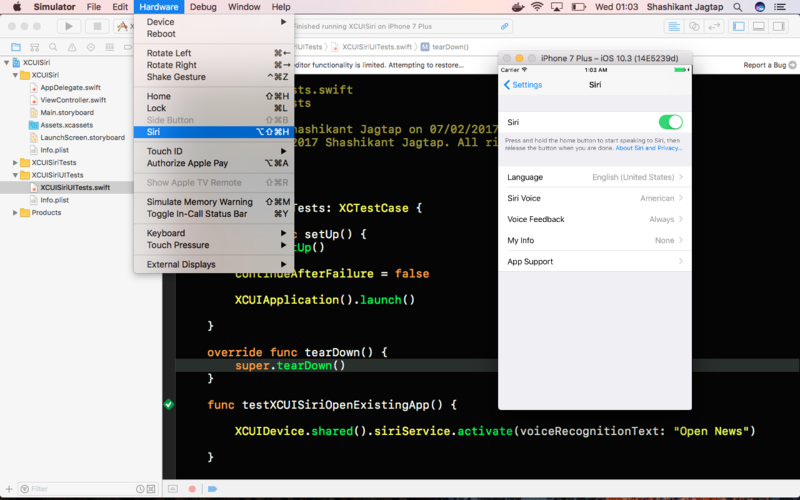 Let's cover how to use the XCUISiriService to interact with Siri by creating a sample application with a few tests. Let's create a new Xcode project as an iOS app with unit and UI testing templates and name it XCUISiri. Now we should have a default iOS app with template UI test code. Now we have to enable Siri from a simulator or a real device. Let's enable it for a simulator by Selecting the 'Hardware' menu and selecting Siri. In the simulator, we can enable Siri from the settings menu as shown below. Now we are all set to try XCUISiriService. Let's add one more test to use XCUiSiriService. We can easily guess that the code above is telling Siri to open Apple's 'News' application. Let's run the test by pressing CMD+U. You can see that the tests have opened Siri and passed the 'Open News' string to it. Siri then acts on it and opens the Apple News app. In this way, we can literally pass any string to Siri and let Siri act on it. We can use Siri to open an app (potentially). We have the ability to automate everything that Siri can do. This piece of code will wait for three seconds to find the button, and it will fail after three seconds if it doesn't find said element. We have passed nil to the handler, which invokes error once the timeout is reached. This causes the test to fail, as well as an error to be thrown. It's very generic and not often useful while debugging. Luckily, we now have better control over errors and handlers with XCWaiter. XCTWaiter: Takes control over to the waiting strategy. XCWaiter class returns results of the expectations in the form of boolean. It returns an enum of four possible situations — .completed, .timedOut, .incorrectOrder, or .invertedFulFilment. We can simply add an extension to XCUIElement or add a simple function that returns the result of the waiter function, which returns one of the results from XCWaiter. There is no callback block or completion handler. The helper method simply returns a boolean indicating if the element appeared. Let's briefly go through each of the boolean results returned by XCTWaiterResult to understand what it is doing. This returns true when defined expectations are fulfilled or completed. It returns false when expectations are not met within specified timeout. Tests will likely to fail when expectations are not met. This will return true when expectations are not met within the timeout period. We can define how to fail our test case by providing useful error messages for debugging. This tells us the expectations that succeeded and which are still waiting to succeed. We know what is taking time to diagnose the problem. Not entirely sure how it works, but as per docs, if an expectation is set to have inverted behavior, then fulfilling it will have a similar effect of failing to fulfill a conventional expectation. We can then pass this expectation to the XCWaiter to get a boolean result. You can find some examples in the demo repo here. XCWaiter gives us boolean results from each expectation, which allows us to define our XCTest with better control. This might help to deal with the flakiness of tests. XCWaiter results simply return whether an element appeared or not. We can define more than one expectation and wait for XCWaiter to return results for each of them. As mentioned above, expectations can be written in a more readable way. Previously, XCtest used to fail if expectations were not fulfilled within the specified timeout, and the error was very generic. Now we have the .timedOut result from XCWaiter so that we can control test failures with proper error messages. XCWaiter gives us more control over how we want to define test failures. This will reduce the flakiness of our tests. The XCWaiter results can also give us the ability to fail or pass tests with proper error messages. I have created a GitHub repo, Xcode83_Demo, with a sample iOS application to give the XCWaiter a try and experiment with XCWaiter features. Feel free to clone it and give it a go. You can get the repo from GitHub: XCUISiriServiceDemo. Try it yourself, make sure you have Xcode 8.3 beta and latest Swift toolchain. Now, if you run tests using CMD+U then you should see tests running. The new class XCUISiriService in XCTest exposed the ability to automate AI-related tasks with XCUI Tests. 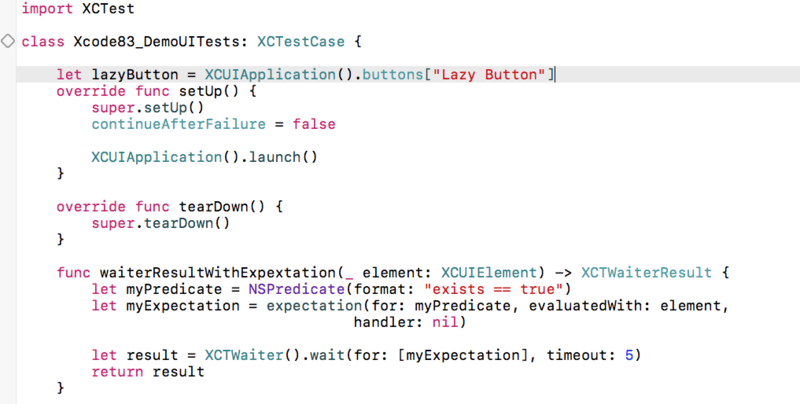 Also, XCTWaiter makes asynchronous testing possible with XCTest. Hopefully, we will get some more insight once the stable version of Xcode 8.3 is released.